An armed robbery and carjacking crew that has been the topic of two Chicago Police Department alerts this month is believed to have struck again three times overnight—twice in Lincoln Park and once in Lakeview. 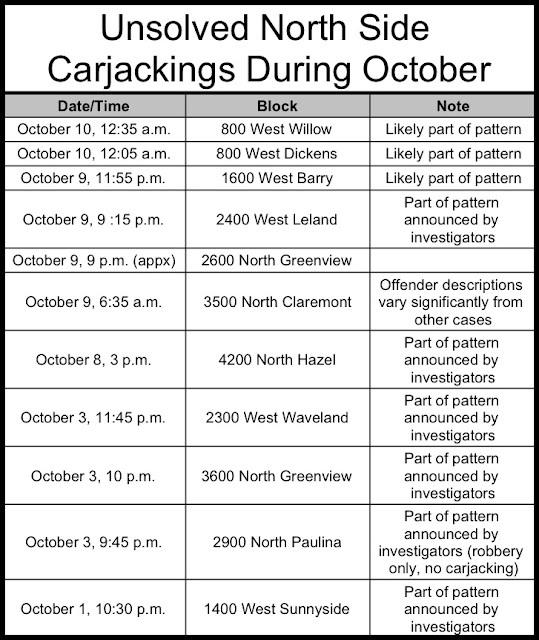 The robbery team is now likely responsible for at least nine robberies and vehicular hijackings on the North Side since Oct. 1st. Two of the cars stolen overnight were later seen traveling together on the South Side, according to police sources. At least one of the cars’ occupants managed to slip away from cops on foot, the sources reported. Around 11:55 p.m., a 25-year-old woman was on a sidewalk in the 1600 block of West Barry when two men approached her with a handgun drawn. The woman handed over her backpack and the men specifically asked for her car keys, she said. Police said the men proceeded to take the woman’s car, which was parked nearby. At 12:25 a.m. today, a 20-year-old food delivery driver was approached by two men, one of whom displayed a handgun, in the 800 block of West Dickens, police said. The robbers took the man’s black 2011 Toyota Camry, his iPhone, and $10 cash. They were last seen driving west on Dickens. Then, at 12:35 a.m., a 26-year-old woman was sitting inside her car in the 800 block of West Willow when a man knocked on her rear door and implied that he had a weapon. He told her to get out of the car and she was then pulled from the vehicle by a second offender, police said. The two men then fled in her white 2018 Ford Fusion. Police in the Woodlawn neighborhood reported seeing the Toyota Corolla from Barry and the Ford Fusion from Willow traveling together. Officers engaged the occupants of the Corolla in a foot chase after they crashed in the 400 block of East Marquette, but the offenders managed to slip away. The car was recovered for its owner by police, a police source said. Officers also recovered the Fusion, which was found abandoned in the 6900 block of South Anthony in the Grand Crossing neighborhood, according to a police source. All three victims reported that the robbers were two black men in their late teens or early 20’s who have slim builds and wore hoodies. An officer involved in the foot chase this morning said one of the suspects may have had dreadlocks and was wearing a gray hoodie with a red stripe on the side. 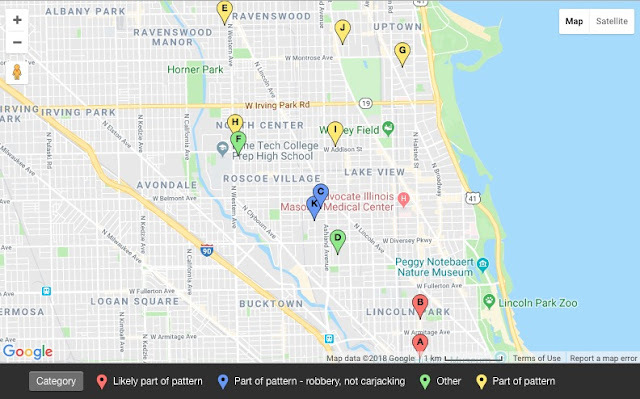 On Wednesday, police updated a community alert for Lincoln Park, Lakeview, Uptown, and other North Side neighborhoods that warned about a series of carjackings in the area. See our full report about the alert and the details of every crime in the pattern HERE. In addition to the wave of carjackings and robberies connected to the primary crew, at least two other carjackings have been reported in the same area since Oct. 1st. Police have advised residents to no sit in parked vehicles or idling cars.